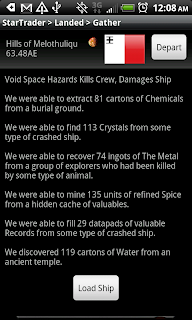 A new release of our epic RPG-space simulation Star Traders has been released to the Android Google Play market and uploaded to the Amazon App Store. New ships! Fixed "Loot All" Button After "Take Ship"
Fixed Reported Issues with "Import Free Captain"
Improved Water Tank/Weapon Cabinet in "Take All"
Improved Water Tank/Weapon Cabinet in "Loot All"